We should proud to have such a beautiful monument Of India And Indian Culture And History. I have also heard the same . 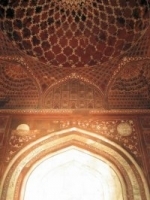 Taj Mahal was build at the time of Veda , Aurangazeb ( I like him most among the mughal after Babar ) maintained the taj mahal as it needed maintenance ………… It is written in a letter written by himself asking his father to provide fund for maintenance . 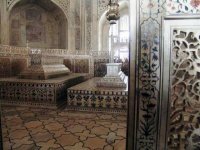 Babar Died in this Taj Mahal in his last age . There were silver doors , Peacock throne etc . It is a Mahal . It cannot be a grave . Tajmahal also have Trisul on the top . Designed with Nag Snakes and Lotus . The Grave is a holy operation . It must be inside the earth the grave cannot be in the 4th Floor . i would like to visit …. all historical places in india ..
Guys don’t fight. Whatever it may be. it may a hindu art or muslim art. It must had been built by one of our Indian forefathers. And it is a great monument stands as an example of indian architecture. I love it and as a Indian we should proud of it. It’s an awesome wounder and perfect place for honeymoon trip. TAJ IS THE IDENTITY OF INDIA.BEING AN INDIAN WE SHOULD HAVE PROUD FOR THAT .IT IS BELIEVE THAT SHAH JAHAN WAS SUPPOSED TO MAKE SAME TAJ MAHAL IN NEAR BY AREA BUT OF BLACK MARBLE.IN THOSE DAYS WORKERS HAND USED TO CUT SO THAT THEY WOULD NOT MAKE SAME MASTERPIECE .BUT WORKERS WERE ALSO EXPERT .ONE CAN WATER DROPPING FROM THE TOMB OF TAJ .MEANS WORKERS SHOWING THERE PAIN.TODAY ALSO PEOPLE ARE CURIOUS TO KNOW HOW TO STOP THIS WATER. Really The Taj Mahal is a wonder. 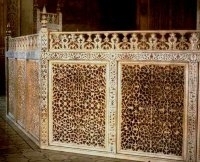 It is the symbol of true love of Shah Jahan for Mumtaz. That should be the spirit of love in us also. Guys, This is Mogul / Persian architecture and not Indian. And for gods sake do’t call Shaajahan as one of the forefathers of India, as one idiot has written here. Only Indians can be stupid of being proud of occupying forces, forces who destroyed our temples, libraries and monuments, universities and created graveyards in our holy places like Mathura and other places. 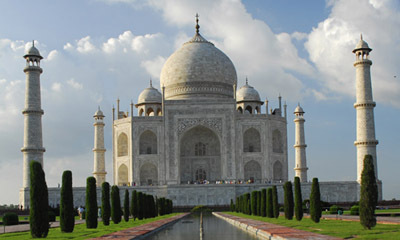 taj mahal is very nice.how has age? Such magnificent architect,and an deeply expression of endless love! The fact here is that the Taj Mahal is a beautiful piece of Architecture which is loved by all. We welcome it and would always cherish it despite the fact of who built it and where it was built. 1. Mumtaz Was Shahjahan’s 4th Wife Out Of His 7 Wives! 2. 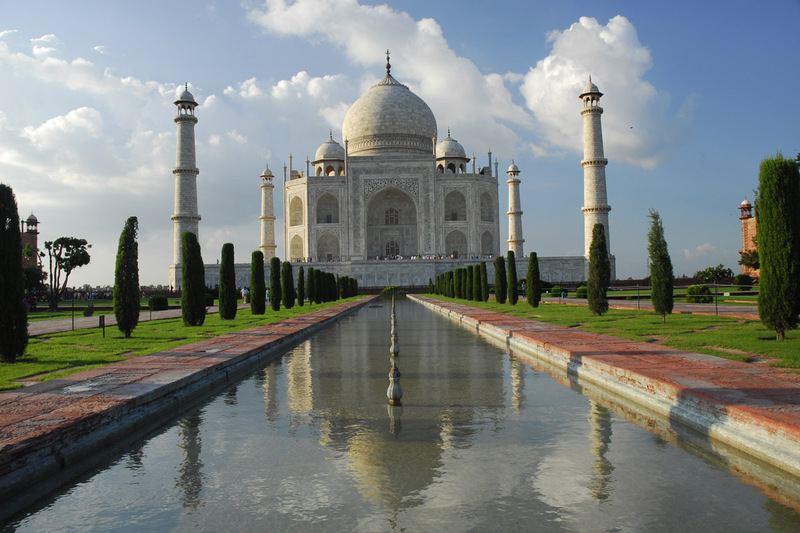 Shahjahan Killed Mumtaz’s Husband To Marry Her ! 3. Mumtaz Died In Her 14th Delivery ! 4. He Then Married Mumtaz’s Sister ! Question Arises Where The Hell Is The “Love”…???!!!! Using 1,000 elephants, 20000 workers, the construction began around 1632 and was completed around 1653. 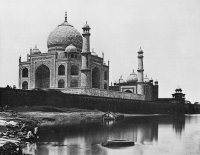 The Mongol (Mughals) Shah Jahan looted the poor farmers of the Doab region – the region between Ganga and Yamuna – and used the money to build this useless tomb for his dead wife. Taj Mahal is a perfect example of misuse of power. He cut the hands of the main architect so that in future he should not build another for anyone else. People say, that is why rain water still drops on the tomb, the architect knew he will be killed and he made a secret passage of water when it rains. No engineers still could find it. If anybody having mind of spending money in this way, he/she can build mahals better than this! No wonder in that!!! !….Instead, they must have built schools or colleges. On the other hand several educational institutes already present in the country – Nalanda and Taxila are examples – were destroyed. It’s only after 1947 that this tomb is generating some income from tourism, but before that for nearly 300 years this tomb was completely useless. There is no word to explain about Taj mahal like GOD as it is not possible to voice the image of GOD. Just look & imagine how it is possible by the human body ?? Brother, What is your opinion about STATUE of UNITY which is building by Modi Sarkar?, is not waste of Public Money and Waste of Laboure…??? Yes, after much research, found out that no one has ever been allowed in the room of Shiv Lingh. Why is the restriction? If this sighted, Shah Jahan’s selfish behaviour of not respecting Hindu religion would be revealed. Also Yamuna river has so much importance from the days of Yami, Radha Krishna and countless Hindu significance. I don’t believe that Taj Mahal was a shiv temple. It’s a false story made by some racists, who hate Muslims or wants some publicity. Please ignore, if someone tells you this false story of taj mahal being a shiv temple. Taj Mahal Built by Shah jahan and anyone don’t say Hindus temple these is Muslim mahal don’t change my mughal empire. 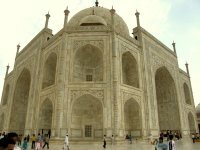 Taj Mahal is the wonder of the world, and it is on the list of world heritage, but Indian government is totally uncaring about such historic asset, and i am afraid it will be destroyed same as Babri mosque.